This incredible story surely will be a Hollywood movie one day! It begins over 550 years ago when “La Peregrina” was worn and appreciated by medieval Spanish and British Royal Households, famous French Generals and beautiful Hollywood movie stars before ending up being auctioned for a fortune by Christies in 2011. The pearl, the size of a duck egg, 50.6-carats, shown here in an incredible Cartier setting, photo courtesy of Christies via Bloomberg, was found by an African slave on the coast of the isle of Santa Margarita in the Gulf of Panama in the mid-16th century. The pearl entered the Spanish Crown Jewels during the period of rule of King Ferdinand V (1479-1516) and his successor King Charles V (1516-1556). La Peregrina then changed Royal families and travelled across the English Channel to England, a traditional enemy of the Spanish at this time. It was sent by the then King of Spain, Philip the 2nd (1527-1598) to be presented to Mary the 1st of England, also known as “Mary Tudor” or “Bloody Mary”. It was sent as a love token in anticipation of their marriage in 1554. After Queen Mary’s death in 1558 the pearl was returned to Spain, where it remained for over 250 years, becoming a favorite ornament of all queen consorts of Spain. On Isabel’s death in 1644, the Pearl was passed to Philips second wife, Mariana of Austria. With the death of Mariana, details of the Pearl were also lost and it wasn’t until about 1813, over a hundred years later, that the Pearl reappears in history. The Peregrina appears back on the scene thanks to Napoleon Bonaparte, and more precisely, his brother, Joseph Bonaparte who sat on the Spanish throne until he was defeated by the Duke of Wellington in 1813. Joseph then had to flee Spain and took with him some of the Royal Spanish jewels and the Peregrina Pearl. When Joseph died in Florence in 1844 he passed the Pearl to his nephew Charles Louis Bonaparte. When Charles was dying he sold the Peregrina Pearl in 1873 to Lord James Hamilton, the 2nd Marquess of Abercorn, who was born in Mayfair, London. During the next few years the pearl fell out of its necklace’s setting on at least two occasions. The first time, the pearl got lost in a sofa in Windsor Castle, the second time, during a ball at Buckingham Palace. On both occasions, the pearl was recovered. It remained in the Abercorn family for over a hundred years until it was placed with Sotheby’s for an auction sale in 1969. Richard Burton purchased the pearl at the Sotheby’s auction in 1969 for $37,000. He gave it to his wife Elizabeth Taylor as a Valentine’s Day gift during their first marriage. At the time Burton purchased the “La Peregrina” it was suspended as a pendant to a delicate pearl linked necklace. They decided to have the necklace re-designed using the expertise of Cartier. The result was a masterpiece of pearls, rubies and diamonds. 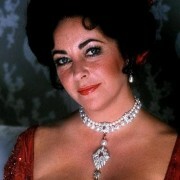 Elizabeth Taylor wore the Pearl in the 1969 film Ann of the Thousand days. It is well known that Richard Burton bought specific jewelry knowing its historical past, and he commented, “It used to belong to the Welsh and I thought it time they got it back”. So what of the Pearl now? After Elizabeth Taylor’s death in March 2011, her jewelry was shown on a world tour and La Peregrina was then sold at auction by Christies in December 2011 for over $11 million!